In the last few days we've come to realise that there's nothing really interesting to see in Thailand. Now in the beginning of this trip when we were still in Saigon we had been talking about how it would be nice to just live in a place like that for a while. So yesterday evening we decided to throw things around and cancel our remaining plans and head straight to Bangkok to spend the rest of our holiday (7 days) right there. So that's where we are now. Bangkok is one of the big bustling metropoles of Asia and I'm liking it a lot already, if only because of the cool highways-on-viaducts that wind through the whole city. It's gonna be fun to be here with plenty of time and no schedule! Sukhothai is good, I found a superb guest house here just by googling - best hotel yet for 15 euro a night. We rented a scooter here to get us around the ruins, which are spread out over a big historical park and its surroundings. They're not spectacular but we had fun scootering around them. Not sure where to next, got online to do some research. Laters! In the afternoon we made a trip to the Tat Kuang Si waterfall, which was the nicest waterfall I've seen so far. Now it had been raining a lot and as a result the path to the middle of the waterfall had become a waterfall itself, so we got all wet but got rather spectacular pictures - pretty much like standing under the waterfall itself. Luang Prabang itself was mediocre, I don't understand why it is hyped so much. Anyway yesterday we flew to Chiang Mai in Thailand. At 11:30 we stepped out of our hotel room in Laos, at 14:45 we had checked into our room in Chiang Mai and 15 minutes later we were in the hotel pool. As expected Thailand is very touristy, I won't like it nearly as much as Vietnam. Chiang Mai isn't very interesting with just lots and lots of small buddhist temples - and I've seen enough of those in Luang Prabang to last a lifetime. But tomorrow we're heading south to more interesting places. Today Lotte followed a Thai cooking course here btw, she enjoyed that a lot. We arrived in Laos yesterday, in the ancient capital of Luang Prabang which is a world heritage site. Today we checked some of the dozens of buddhist temples here, tomorrow we'll do more and in the afternoon go visit some nearby waterfalls where we can also swim. Tbh it's a bit less interesting than our previous destinations here, but Angkor is a very tough act to follow of course. Yesterday we did more temples and more swimming. The temples were as awesome as before, Angkor is really amazing. In the temple that is covered by jungle (a famous sight) we got a great pic of us in the most picturesque spot; sitting between tree roots which grab an ancient building. Usually when you ask someone to make a picture the result is awful, but this time we got really lucky. Clicking these pics will open the Picasa web albums. Aight gotta run now, see you in Laos. So yesterday we took the bus to Siem Reap. The bus was comfy and timely, but unfortunately it had many loudspeakers installed and they were used to subject us to Cambodian music during most of the trip, with the cheesy videoclips playing on two screens to rub it in. Fortunately I had my mp3-player with me. Lotte was not so lucky, but when faced with the terror that is Cambodian music, it is each man and woman to him/herself. Today we went to see the tempels for the first time. 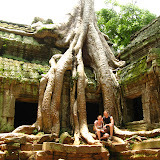 We started with Angkor Wat itself, which is actually only one of many ancient monuments. Next I saw the bayon, one of the other start temples. Both are magnificent and huge with incredible amounts of ornamentation. Way more impressive than the Mayan pyramids, almost on par with Egyptian monuments - that good. Today was our last day here. In the morning we first found a pharmacy to get something to ease the many insect bites we have - Lotte didn't sleep at all because of the itching. We got a nice pic of our legs full of bites :) Afterwards I visited the royal palace here, with the silver pagoda inside, and it was absolutely beautiful, even more than expected. Very beautiful architecture they have here. I think I made 200 pictures in 2 hours. Then we went to the famous Killing Fields. There's only a pagoda with skulls of victims piled up, the actual killing fields are just that - fields. With some trenches where the mass graves were. Tomorrow we head to Siem Reap - the town near Angkor Wat - for three nights. I've booked a room with a balcony in a nice hotel with a swimming pool, so if the reservation holds we can swim every morning and evening the next few days. But first we got a long bus ride to do. Today the Monsoon finally lived up to its reputation and gave us an hour of torrential rain in the afternoon continued by a lot more dripping. We had been taking a slow day anyway, only visiting the genocide museum Tol Slueng in the morning. We waited out the rain on the balcony and then went to see the Wat Phnom temple to which Phnom Penh owes its name. It was lovely. Afterwards we strolled around the town and stumbled upon a huge mall where I splurged on a huge ice cream - a slow day as I said. Phnom Penh is great btw, wide boulevards and big squares everywhere, and lots of buildings with roofs in the lovely Cambodian temple style. Hello from Phnom Penh. 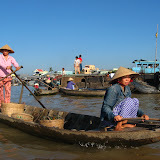 The first one and a half days of the tour in the Mekong delta were great, boating through local markets. The other one and a half day were bad though as we spent most time just traveling. But now we're in the capital of Cambodia (my 40th country btw!) and from what I've seen so far this town looks as nice to be in as Saigon, and it has more to see. We'll stay two or three nights to see the royal palace, the silver pagoda and the killing fields before heading to Angkor Wat. We're making this trip in the middle of the rainy season. We'd been worried about that but here's how it's been so far: a few raindrops (not even enough to get wet) at 6pm on day 1, the same on day 2, no rain at all on day 3, and today (day 4) 5 minutes of normal rain. So far I have to say the notorious Asian Monsoon doesn't hold a candle to Belgian rain. Hi again. Today was the one day we took to see Saigon and we made good use of it. We saw three buddhist pagodes (and got to climb up the tower of one), two busy markets and the war museum. Tomorrow we're off on a three day tour of the Mekong delta to see floating markets and village life; on tuesday evening we finish it in Phnom Penh. Probably won't be online until then or the day after. Hello from Saigon! We arrived in the late afternoon after stopovers in Frankfurt and Bangkok. For the first time in my life I managed to get some sleep on a plane - Lotte credits her soothing presence - so I'm feeling good. We immediately liked this city; it's very lively and colourful, it's also clean and there are a hundred places to eat in every street. I think I'm gonna eat noodle soup and fried rice every day this trip, yum. We got a clean room with bathroom, airco, fridge and satellite tv for 12$, and had a full meal for about 3$ each. I decided to start with noodle soup so tomorrow I'll have fried rice for lunch. Anyway it's evening now and Lotte is sleeping while I'm wide awake due to jet lag so here I am. If this were the end of our trip we'd be buying lots of stuff in the shops here, lots of nice statues and handmade bags and scarfs etc. As it is we'll just hope Bangkok has all this stuff too. Fly from Luang Prabang to Chiang Mai in the north of Thailand. That leaves us 11 days to travel from Chiang Mai to Bangkok, from where we'll be flying back to Belgium. If we're not tired of temples by then we'll visit the old Thai capitals of Sukhothai and Ayuthaya along the way, and we'll also try to visit a nature reserve. As usual I'll occasionally post something here to keep the homefront up to date. We'll be back August 5th. While googling for myself I found out there's now another Godsmurf who's making hip-hop music, check out his music on Godsmurf.net. My favourite is track 10 because it begins with "This is a Godsmurf production", haha. I'll have to eliminate this impostor though. There can be only one. Godsmurf, I like some of your images. How do we get in touch with you?